If you’re trying to decide what to think about the deal struck between the major powers and Iran in Geneva, here’s a suggestion – imagine what would have happened if there had been no deal. In fact, one doesn’t have to use much imagination. In 2003, Iran approached the United States with an offer to talk about its nuclear program. The George W. Bush administration rejected the offer because it believed that the Iranian regime was weak, had been battered by sanctions, and would either capitulate or collapse if Washington just stayed tough. So there was no deal. What was the result? Iran had 164 centrifuges operating in 2003; today it has 19,000 centrifuges. 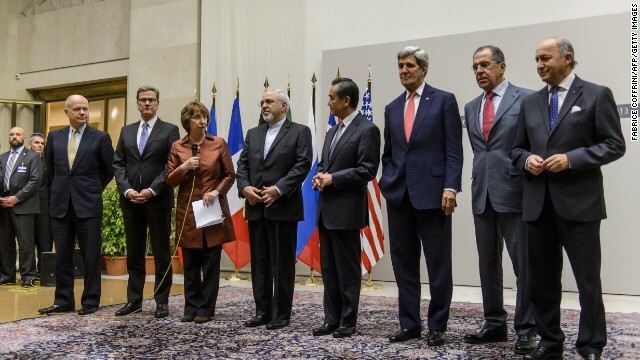 Had the Geneva talks with Iran broken down, Iran would have continued expanding its nuclear program. Yes they are now under tough sanctions, but they were under sanctions then as well. Israeli Prime Minister Netanyahu has been opposed to a deal. But is it in Israel’s interest that Iran’s program keep growing in size and scope? That’s a strategy that assumes that either Iran is heading for collapse, or that a military strike will take place that would permanently destroy Iran’s entire nuclear program. This seems more like wishful thinking than tough strategizing. The agreement that the major powers have gotten in Geneva essentially freezes Iran’s program for six months – and rolls back some key aspects of it – while a permanent deal is negotiated. In return, Iran gets about $7 billion of sanctions relief, a fraction of what is in place against it. The main sanctions – against its oil and banking sectors – stay fully in place. More from GPS: What would JFK have done about Iran? This is a sensible deal – signed off on by France, Britain, Germany, Russia and China – but it is just an interim deal and not a historic rapprochement. And that’s why so much of the opposition to it is misplaced. Washington has many points of disagreement with Tehran, from its opposition to Israel and its support of Hezbollah to its funding of Iraq militias. This is not like the opening to China – it’s more like an arms control deal with the Soviet Union, with two wary adversaries trying to find some common ground. Many countries in the Middle East – from Israel to Saudi Arabia – have legitimate concerns about Iran. But many of these countries have also gotten used to having a permanent enemy against whom they could rail, focusing domestic attention, driving ideological and sectarian divides, and garnering support. The Middle East is undergoing so much change. Perhaps this is one more change. And perhaps Iran will come in from the Cold. For now, this deal is just one step, not a seismic shift. But it is still a step forward. o Iran's petrochemical exports, as well as sanctions on associated services." Now, to me, that says that the US (and the EU) is going to lift it's sanctions on Iran's oil industry, after all, "petrochemical" not to mention the "associated services" is just a FAR MORE REACHING way of saying "oil sector" right? Can you explain this? Am I reading this right? Is this the correct copy of the agreement? I got this copy from this CNN article: http://www.cnn.com/2013/11/24/world/meast/iran-nuclear-deal-qa/ and here's the link to the actual agreement: http://i2.cdn.turner.com/cnn/2013/images/11/24/iran.text.pdf So, I ask, can you clarify this for me? I will never be in prison, you however, your day is coming. It only takes one act to differentiate you as a simple hating Nazi that cannot think for himself, to crossing the line into doing something against the law.